As the competitors gathered on Sunday for the Autumn Pairs competition it was heralded by the first real blast of cold air this season. There was a stiff northerly breeze with intermittent, sometimes heavy squalls but it did nothing to deter the eagerness and high standard of fishing prowess displayed, even thought there were many numb hands to contend with. There were 30 competitors on the day, many old hands mixing with the new in a spirit of friendly rivalry that is synonymous with the sport we have chosen to see us through life. When the soggy score cards were rounded up and prised from their owners frozen grip then the clear winners on the day were the pairing of Andy Bannerman and Paul Sharp with 46 points followed in 2nd place by Stuart Crockett and Gary Marshall on 29 points then very closely behind in 3rd spot were Colin Craik and Greg Leslie on 27 points. On the final whistle everyone then converged to the warm bothy where the hot soup and sandwiches were gratefully consumed along with stories about the ones that got away. A special prize was also given out to our youngest ever competitor – Jasmine McPhee aged 10 from Peterhead who was fishing with her dad Charlie Jasmine did really well to catch 3 fish but her dad Charlie (who claims to have taught her everything she knows) was a bit quieter when Jasmine gently ribbed him as to how many he got. Lets just be kind and say he was less engaged with the fish on the day than his daughter was. Hopefully the experience Jasmine gained in this competition will bode well for the future junior competitions she has signed up for and we wish her well. On the fishing front, down Lochter way, for most of the week conditions were mild and once again on any part of a session anything from top to bottom of the water could prove effective. 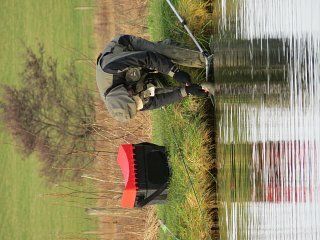 Paul Ingram on a day where there was a prodigious amount of surface movement was rewarded with 11 fish on dry black ants or very small bibios. Jamie Cordiner likewise had a Kate McLaren and black Pennell combination, which accounted for 10 fish, one a lovely 8 lber that was returned to fight another day. Lures are now starting to come into their own and Bill Whyte had a tremendous day with 24 brought to the net on WSW, Pete Green used the WSW in combination with a fritz to land 19 fish and Graham Duthie had 18 fish which included an 8 lber and two at 5 lbs and Davie Wood had 11 fish on his friend Walters WSW. Looking through the returns book other notable efforts were: Karen Gillies from Huntly with 15 fish on the bloodworm and buzzer, Ian Hamilton with 14 fish on nymphs, Dave Murray with 12 fish on cormorants and Bill Wood with 11 fish on buzzers and fritz. We are now operating our winter opening hours of 8am – dusk (5pm just now) so it is still 9 hours of potential fishing fun!